Of course this wasn’t a news headline on this day- because we are talking about the Soviet Union in the late 60’s after all. There was an assassination attempt on the General Secretary of the Central Committee of the Communist Party of the Soviet Union [now that is some title} Leonid Brezhnev. A deserter from the Soviet Army called Viktor IIyin fired shots at a motorcade in Moscow that was celebrating the four cosmonauts who had recently returned from space aboard Soyuz 4 and Soyuz 5. Brezhnev and Soviet President Podgorny were riding in a close limousine several cars behind the cosmonauts when the shots were fired as the procession approached the Kremlin’s Borovitsky Gate. Brezhnev and Podgorny were unharmed- the assassin was firing at the wrong car- the driver was killed. In all fourteen shots hit the limousine before a guard ran down the assassin.The Soviets didn’t report this in their press and it wasn’t until 24 hours later that a Foreign Ministry spokesman confirmed the rumors of the shots being fired. Viktor IIyin was judged to be insane and spent the next twenty years in a psychiatric hospital being released in 1990. Love those eyebrows Leonid. 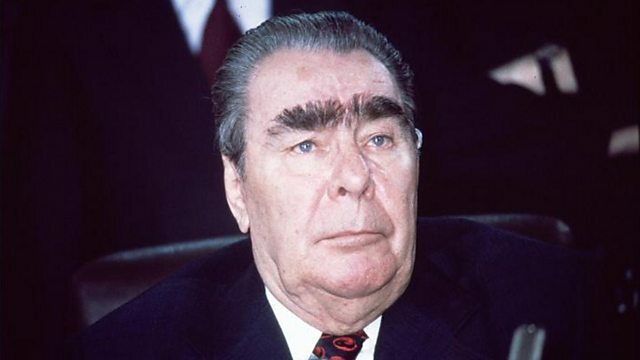 Brezhnev died in November 1982 at the age of 75. Born on this date- English-American actress Olivia d’Abo- who is probably best remembered as Kevin Arnold’s teenage hippy-sister Karen in The Wonder Year- turns 50 today. How can that be? They say the bullets ricocheted off his eyebrows. They might have! Those eyebrows could have been part of their military defense system. I was kind of surprised he was 75 when he died- he looked 75 for 20 years. I know you put words after that picture, but I couldn’t tear my gaze down from that picture to read them.